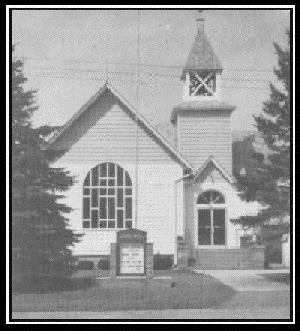 The Glennie Methodist Church was organized on December 25, 1903 under the leadership of Rev. W. F. Gawn. There were seventeen charter members. Mr. C. E. Schoolcraft served as Sunday School Superintendent. Mr. Schoolcraft also drew the plans for the building patterning it after the Asbury Methodist Church in Traverse City, Michigan. The Corner Stone of the Church was laid in 1905, and the building was dedicated on December 5, 1907. The two rooms were heated by wood stoves until 1923 when a basement was built in back to the church and the building moved onto it. Soon after the church was built a parsonage was added to provide for the minister's family. In the winter of 1914 it burned and was rebuilt. The second parsonage to house the ministers and their families until 1969 when the present parsonage was built. It was financed partially with funds received through the will of a former member, contributions of present members and friends, and the hard work of faithful men working under the guidance of a local contractor. Many gifts have been given to the Church over the years in memory of loved ones passed on, and just gifts of love for the church. Twenty-seven ministers have brought the hope which is in Jesus Christ to the people during the seventy-five years existence of this church. From this church two fine ministers were given to the Detroit Conference - Rev. John Dingle and Rev. L. F. Merrill, both of whom were inspired to preach by the faithful ministery of Rev. C . S. Brown. For 7 years Glennie was a combined charge with Harrisville. Since 1947 the Glennie and Curran Churches have continued to work together under the leadership of one Pastor. Used with the permission of Rev. George H. Morse. Above material contributed by Ronald J. Sortor, 1997. The information on these pages is meant for personal genealogical research only and is not intended for commercial use of any type.